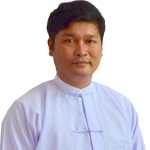 Aung Kyaw Htway is a senior analyst in BGA’s Myanmar office. Aung joined BGA Myanmar following a distinguished career as a civil society leader and journalist. Aung began his journalistic career working for the English language weekly, The Myanmar Times. He worked his way through the ranks from reporter to editor before moving on to the non-profit sector. As a communications officer for Save the Children in Myanmar, Aung oversaw the organization’s emergency and development program communications. Aung is a graduate of the Yangon University of Foreign Languages with a degree in French. He also holds a master’s degree in public affairs from the University of the Philippines.